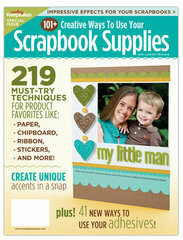 101+ Creative Ways to Use Your Scrapbook Supplies is one of the newest special issue releases from Creating Keepsakes. The author, Jennifer McGuire, has long been know in the scrapbooking industry as a bit of a technique guru, so if you're at a point in your scrapbooking where you want to find fresh ways to use old products and challenge yourself in the process, this issue is for you! As the cover implies, you'll find 219 fun techniques using our favorite products paper, stickers and die cuts, chipboard, fabric and ribbon, hardware and one under-appreciated basic - ADHESIVE! There is a handy index in the back so that you can quickly locate techniques by product type, layout theme, layouts by number of photos, and more. In all, there are 90 beautiful layout samples included in the special issue to illustrate the techniques. The remaining techniques are sampled on cards, tags, customized embellishments and more. 101+ Creative Ways to Use Your Scrapbook Supplies is available at Scrapbook.com for $14.99. I also have one copy of 101+ Creative Ways to Use Your Scrapbook Supplies to give away to one lucky reader this week. What is the most creative way you've used a basic scrapbook product? Want a 2nd chance to win?? Leave a SECOND comment with a link to a picture of your layout or project showing the technique you mentioned in your first comment. Random.org will choose and I'll announce the winner on Friday...and I might just feature a few of the projects you share as well!